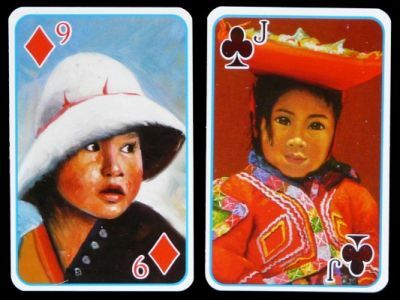 All the cards are illustrated with children portraits from colourful paintings. Only the joker has a text saying "Danza de la Diablada – Puno" (Dance of Devils in Puno). I'm not sure why this is mentioned. As far as I know the cards present traditional Peruvian costumes from different regions and they do not seem related to this traditional South American dance.